Personal Lea: Mothers Day, Fathers Day, Graduation, Oh My! Mothers Day, Fathers Day, Graduation, Oh My! Hello! 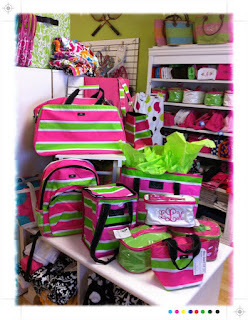 There are so many big gift-giving days coming up - and we are fully stocked with fun things for everyone! Send in the kids (you can even wait in the car if you want to be truly surprised) and we will help them pick something out for Mothers Day, we will personalize and wrap it and bring them back out to you! Now THAT is full service! Watch over the next weeks as we start to gear up for graduation gifts, bridal gifts and Fathers Day as well - if there is something particular you have in mind and you think we might need to order it, let us know ASAP so we can get on it! We also plan on hosting a 1st Birthday celebration later this month - it will be open to everyone, no mailed invites, just cupcakes and champagne! So continue to watch Facebook and the blog for further details! We have 2 contests going on until April 15th - both of them are for $50 gift certificates - one is for people who 'check in' via their Iphones - and the other is for people who 'like' the LOCAL BUSINESS Preppy In Paradise Facebooks page (there is also a COMPANY page, but we are trying to convert to the other one!). This is the last week so get busy people! Congrats to Li-Su Javedan who won the wall monogram contest by telling us via Facebook which one of the designs was her favorite!